Metricbeat, which is one of several Beats that helps send various types of server data to an Elastic Stack server, is a lightweight data shipper that, once installed on your servers, periodically collects system-wide and per-process CPU and memory statistics and sends the data directly to your Elasticsearch deployment. This shipper replaced the earlier Topbeat in version 5.0 of the Elastic Stack. Filebeat: collects and ships log files. Packetbeat: collects and analyzes network data. Winlogbeat: collects Windows event logs. Auditbeat: collects Linux audit framework data and monitors file integrity. Heartbeat: monitors services for their availability with active probing. In this tutorial, you will use Metricbeat to forward local system metrics like CPU/memory/disk usage and network utilization from a CentOS 7 server to another server of the same kind with the Elastic Stack installed. With this shipper, you will gather the basic metrics that you need to get the current state of your server. Two CentOS 7 servers set up by following the Initial Server Setup with CentOS 7 guide, including a non-root user with sudo privileges and a firewall set up with firewalld. To set up firewalld, follow the "Configuring a Basic Firewall" section of the Additional Recommended Steps for New CentOS 7 Servers tutorial. On one server, you will download the Elastic Stack; this tutorial will refer to this as the "Elastic Stack server." The Elastic Stack server, which in this tutorial will have 4GB of RAM and 2 CPUs, will monitor your second server. This second server will be referred to as the "second CentOS server." 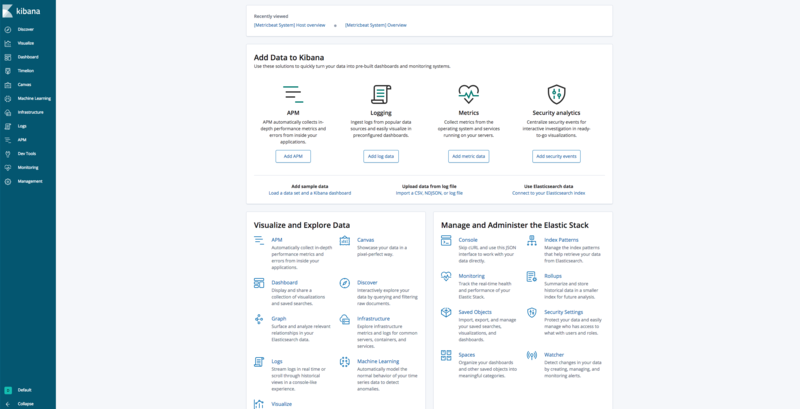 The Elastic Stack installed on the Elastic Stack server by following the tutorial How To Install Elasticsearch, Logstash, and Kibana (Elastic Stack) on CentOS 7. Note: When installing the Elastic Stack, you must use the same version across the entire stack. In this tutorial, you will use the latest versions of the entire stack, which are, at the time of this writing, Elasticsearch 6.7.0, Kibana 6.7.0, Logstash 6.7.0, and Metricbeat 6.7.0. The tutorial How To Install Elasticsearch, Logstash, and Kibana (Elastic Stack) on CentOS 7 restricted Elasticsearch access to the localhost only. In practice, this is rare, since you will often need to monitor many hosts. In this step, you will configure the Elastic Stack components to interact with the external IP address. The address 0.0.0.0 is assigned specific meanings in a number of contexts. In this case, 0.0.0.0 means "any IPv4 address at all." Rich rules allow you to create more complex and customizable firewalld rules to gain greater control over your firewall. In this command, you are adding a rule that accepts ipv4 traffic from the source, which you have set as the IP address of the second CentOS server, to port 9200 of your Elastic Stack server. Repeat these commands for each of your servers if you have more than two. If your servers are on the same network, you can allow access using one rule for all hosts on the network. To do this, you need to replace the /32 after the IP address with a lower value, for example /24. Now that you know the connection works, you are ready to send metrics to your Elastic Stack server. In the next two steps, you will first install Metricbeat on the Elastic Stack server and import all the needed data, then install and configure the client on the second CentOS server. Once the installation is complete, load the index template into Elasticsearch. An Elasticsearch index is a collection of documents that have similar characteristics. Specific names identify each index, which Elasticsearch will use to refer to the indexes when performing various operations. Your Elasticsearch server will automatically apply the index template when you create a new index. Metricbeat comes packaged with example Kibana dashboards, visualizations, and searches for visualizing Metricbeat data in Kibana. Before you can use the dashboards, you need to create the index pattern and load the dashboards into Kibana. 2019-03-20T09:51:32.148Z        INFO    template/load.go:130    Template already exists and will not be overwritten. 2019-03-20T09:51:32.148Z        INFO    instance/beat.go:894    Template successfully loaded. 2019-03-20T09:51:56.209Z        INFO    instance/beat.go:741    Kibana dashboards successfully loaded. Metricbeat will begin shipping your system stats into Elasticsearch. The line "total" : 108, indicates that Metricbeat has found 108 search results for this specific metric. Any number of search results indicates that Metricbeat is working; if your output shows 0 total hits, you will need to review your setup for errors. If you received the expected output, continue to the next step, in which you will install Metricbeat on the second CentOS server. Perform this step on all CentOS servers from which you want to send metrics to your Elastic Stack server. If you also have Ubuntu servers, you can install Metricbeat by following Step 3 of How To Gather Infrastructure Metrics with Metricbeat on Ubuntu 18.04. The Elastic Stack components are not available through the yum package manager by default, but you can install them by adding Elastic's package repository. All of the Elastic Stack's packages are signed with the Elasticsearch signing key in order to protect your system from package spoofing. Your package manager will trust packages that have been authenticated using the key. In this step, you will import the Elasticsearch public GPG key and add the Elastic package source list in order to install Metricbeat. Note: Metricbeat's configuration file is in YAML format, which means that indentation is very important! Be sure that you do not add any extra spaces as you edit this file. You can extend the functionality of Metricbeat with modules. In this tutorial, you will use the system module, which allows you to monitor your server's stats like CPU/memory/disk usage and network utilization. You can see the parameters of the module in the /etc/metricbeat/modules.d/system.yml configuration file. In the case of this tutorial, you do not need to change anything in the configuration. The default metricsets are cpu, load, memory, network, process, and process_summary. Each module has one or more metricset. A metricset is the part of the module that fetches and structures the data. Rather than collecting each metric as a separate event, metricsets retrieve a list of multiple related metrics in a single request to the remote system. Repeat this step on all servers where you want to collect metrics. After that, you can proceed to the next step in which you will see how to navigate through some of Kibana's dashboards. In this step, you will take a look at Kibana, the web interface that you installed in the Prerequisites section. Here, you can search and browse through your metrics and also customize your dashboard. At this point, though, there won't be much in there because you are only gathering system stats from your servers. Use the left-hand panel to navigate to the Dashboard page and search for the Metricbeat System dashboard. Once there, you can search for the sample dashboards that come with Metricbeat's system module. Kibana has many other features, such as graphing and filtering, so feel free to explore. In this tutorial, you've installed Metricbeat and configured the Elastic Stack to collect and analyze system metrics. Metricbeat comes with internal modules that collect metrics from services like Apache, Nginx, Docker, MySQL, PostgreSQL, and more. Now you can collect and analyze the metrics of your applications by simply turning on the modules you need. If you want to understand more about server monitoring, check out An Introduction to Metrics, Monitoring, and Alerting and Putting Monitoring and Alerting into Practice.